It feels like a privilege to read Chris Claremont. His style is so different from most comics today: he gives lots of running commentary from the protagonist, both in thought bubbles and spoken aloud even when no one is around to hear. Reading Nightcrawler is like stepping into a simpler world. 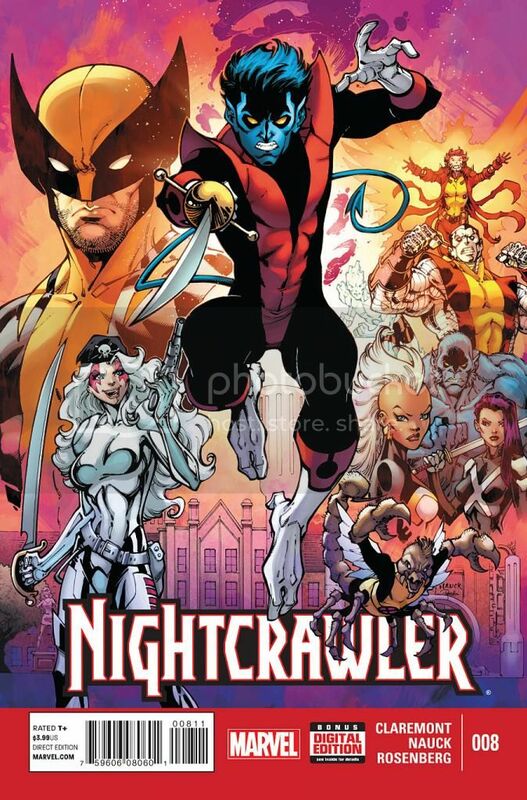 A consistent characteristic I appreciate about Nightcrawler is the lack of hype. Its self-contained stories don’t feel the need to cross over with other titles or tie into any larger event (other than allowing Kurt to grieve Wolverine’s death last issue). I never get the sense reading Nightcrawler that Claremont is trying too hard, or trying to awe and surprise readers — I wish several other writers would learn from him. This issue opens with Kurt in the Danger Room, dueling for sport with Colossus. Colossus fastballs a volleyball at Kurt’s head, knocking him out, when suddenly he bamfs away. Who’s there to greet him but Bloody Bess, one of the Crimson Pirates whom Kurt knew years ago. Bess greets Kurt with a generous smooch, and explains that the rest of the Crimson Pirates are currently possessed by a mysterious opponent. Meanwhile, back at the Jean Grey School, we’re introduced to a new character: Ziggy, a girl who’s working on Kurt’s Blackbird. Ziggy and Rico are friends. Ziggy obviously has a high level of mechanical and technological expertise. I’m thrilled that Claremont is writing a girl who is in STEM. We need better representation in comics, and Claremont has made a great choice in how he introduces Ziggy here. I can’t wait for further development of Ziggy and Rico. Todd Nauck and Rachelle Rosenberg are one of the best artist/colorist pairings I’ve seen this year. I wish Nauck worked on more titles simply because I love his style: poses and facial expressions are well-defined, he uses a wide variety of camera angles, and he goes way beyond the average level of detail — see Broadside’s chain of bullets around his arm and chest, and the pouches on his leg. Two of my favorite panels: Ziggy’s shock when Bamfs appear to teleport her away, and Bess throwing sand up into Broadside’s face — Rosenberg makes the explosion of sand absolutely stunning, like a galaxy in outer space bursting with light. Claremont knows how to tell a story with a beginning, a middle, and an end. Even as this issue closes with a cliffhanger, we feel satisfied that we read something that had a clear vision, not just an amalgamation of plot devices and hype. I like how Nauck styles Ziggy, and how Rosenberg colors the scene when Ziggy works on the Blackbird with a warm, sunset glow. This is a fun and beautiful book by a creative team unswayed by modern comics’ tired trends.